Product prices and availability are accurate as of 2019-04-06 19:29:13 EDT and are subject to change. Any price and availability information displayed on http://www.amazon.com/ at the time of purchase will apply to the purchase of this product. 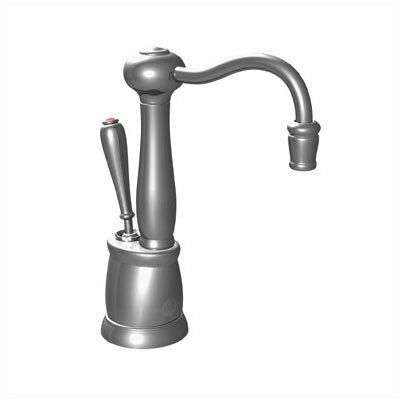 F-GN2200SN Finish: Satin Nickel Shown in Satin Nickel Features: -Ornate and distinctive swivel spout.-Stylish, integrated lever provides a dramatic look.-For use with InSinkErator's Stainless Steel Tank and F-201 Filtration System (tank not included).-Chrome.-Satin Nickel.-Oil Rubbed Bronze. Construction: -Durable all brass faucet construction. Specifications: -Hot Only - dispenses near-boiling 200 F water. Warranty: -5-Year We Come To You In-Home Service Warranty. Made of brass in oil rubbed bronze Single lever handle faucet with graceful swivel spout Hot lever automatically shuts off for safety Single hole installation Dimensions: 5.25L x 5.25W x 8H in.